If you want to start a new business or develop an established one to make it more profitable, you can get help here. Free – browse and follow my blog posts. Budget – buy my book New Business Next Steps (commissioned and published by Pearson Plc and used by thousands of business owners). In a group – join Drive the Network for peer group and individual mentoring and lots more free resources. On-line at your own pace – buy the highly acclaimed Work Smart Not Hard Programme. 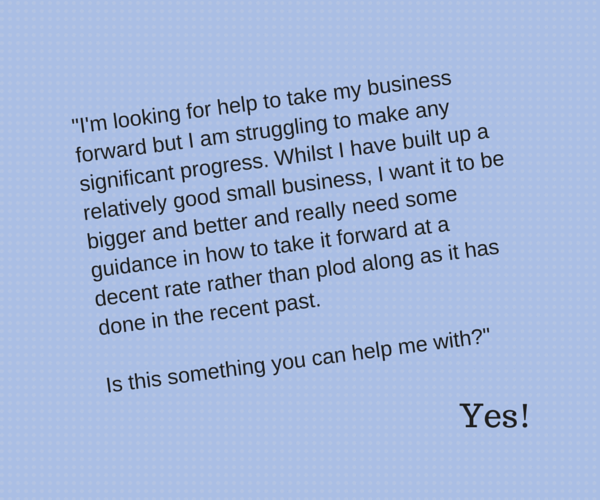 One to one – work with me to produce a business growth plan, based on the kind of business you want, the income you’d like to have and the kind of life you’d like to lead. I keep you on track with your plans and you have unlimited email access to me to check things out as you go. Just let me know if you’d like to discuss this option. You’ll benefit from my twenty five years worth of experience of working with business owners, knowledge of the most up to date as well as established business thinking and practices, and most importantly, a deep understanding of what makes business owners tick and what it takes to be successful. Unlike many coaches I also bring a huge network of very useful people who can help you to find exactly what you need. You’ll get totally practical, no-nonsense advice and guidance tailored to your exact situation, personality and lifestyle. Prices depend on how much work is involved but I’ll tell you up front and there’ll be no minimum contract or hidden extras. You’re always in charge of what you spend. You betcha! Check out the testimonials from my happy clients (most of whom refuse to leave). Hope to see you soon so that you can get started on building the business you really want! Buy the Work Smart Not Hard Programme plus 3 months on-line mentoring for just £299!